Home Posts Tagged "corporate ag"
Iowa Citizens for Community Improvement Action Fund (Iowa CCI Action Fund) members say time in this year’s legislative session is running out for Governor Branstad and leaders in both political parties to address the kinds of factory farm pollution that continue to cause a public health risk to hundreds of thousands of Central Iowans. Today, the Iowa Policy Project released a report (found here) outlining the negative effects of the controversial practice of frac sand mining, and recommending that authority over the industry be kept at the local level. 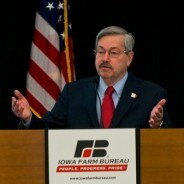 Pointing to Iowa’s factory farm industry as a case study of the problems that arise when local control of environmentally degrading industries is preempted by state government, the report offers a number of policy proposals, the foremost of which is the retention of local control over the industry. 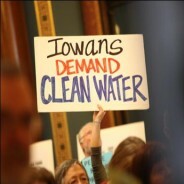 The Iowa legislature passed an agriculture and natural resources appropriations bill Thursday that includes $700,000 to hire seven new factory farm inspectors at the Iowa Department of Natural Resources (DNR), and Iowa Citizens for Community Improvement (Iowa CCI) members say DNR Director Chuck Gipp must put the new inspectors in the field immediately to begin inspecting and permitting Iowa’s 8,000 factory farms.